Bathroom Vanities Market Analysis By Material, Application To 2020 - Grand View Research, Inc. 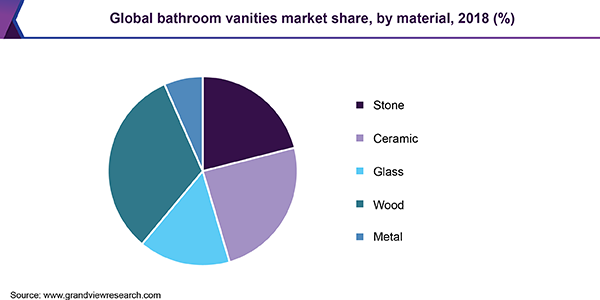 Growing preference towards green and eco-friendly materials such as recycled glass and engineered stone is expected to trigger demand for the bathroom vanities market. Rising remodeling and reconstruction activities due to changing consumer preferences is expected to boost demand for bathroom vanities through the forecast period. In addition, preference towards customized premium features such as assembled countertop vanities and DIY tools are expected to boost volume demand for the material used. Rapid infrastructure development in emerging economies is expected to favorably impact market growth. Demand for formaldehyde free solid wood cabinets owing to high degree of awareness amongst consumers is expected to enhance product quality. For instance, KCMA’s Environmental Stewardship Program in the U.S. provides cabinet manufacturers a platform to manufacture eco-friendly products complying with the California formaldehyde emission regulations. Surge in demand for colorful countertop materials such as lava stone, engineered stone, marble, etc owing to wide range of pattern, price affordability and accountability of these products in bathroom application is expected to spur market growth through the forecast period. However, high design cost and stability in extreme conditions is expected to hinder bathroom vanities market growth over the forecast period. Bathroom vanity materials include wood, stone, glass, ceramic and metal. Wood is a major component in cabinets; modern cabinetry is often frameless and is typically constructed from engineered materials, such as MDF, plywood, or chipboard. The visible surface of this material are usually clad in plastic laminates, paint or timber veneer. Increased focus on user experience or accessibility coupled with abundant amenities such as innovative storage options, rollouts, pullouts for styling products, hair dryers or makeup is increasingly gaining demand for better materials in the bathroom applications. Rising demand for Medium density fiber common known as MDF over the solid wood material is expected to revolutionize the wood-based cabinetry market. Engineered stone such as quartz has emerged as one of the most preferred materials for bathroom applications. This can be attributed to the uniform internal structure, low maintenance, strong polymer resin binding and non-porous characteristics. Glass countertops come in a wide array of varieties such as solid glass, glass with LED backlighting and recycled high-density polyethylene countertop material. The glass material can be used in doors, slabs, and countertop applications. This material can also used as backsplashes or tiles that are installed with the cabinet tops. Demand for recycled glass in bathroom vanities market is expected to rise over the next six years. The material possesses non-porous, non-chipping or cracking properties and is also lighter than any other countertop material. The bathroom vanities market can be segmented by application into residential and non-residential sector. Rising demand from new housing and remodeling activities over the past few years has significantly improved market penetration in residential sector. Growing demand for vanities with value-added amenities such as pull-out drawers and built-in chips that allow usage of electric toothbrushes and curling irons off the counter is expected to boost up the bathroom vanities market over the forecast period. Growing demand for non-residential applications can be attributed to construction and renovation activities of healthcare facilities, restaurants, hotels, retail shops, schools, offices and other facilities. Rising healthcare, lodging and education construction spending is also expected to support demand for bathroom vanities, as these structures incorporate secure storage with lesser space requirement. Manufacturers compete on quality and design to enhance market share and leverage through branding. The bathroom vanities market comprises of companies such as Masco, American Woodmark, MasterBrand Cabinets, Foremost Group, Avanity Corporation, and among others. Masco has been the market leader followed by MasterBrand and American Woodmark. Extensive product portfolio, industry knowledge, innovation and application expertise has enabled Masco to gain large and loyal customer base.